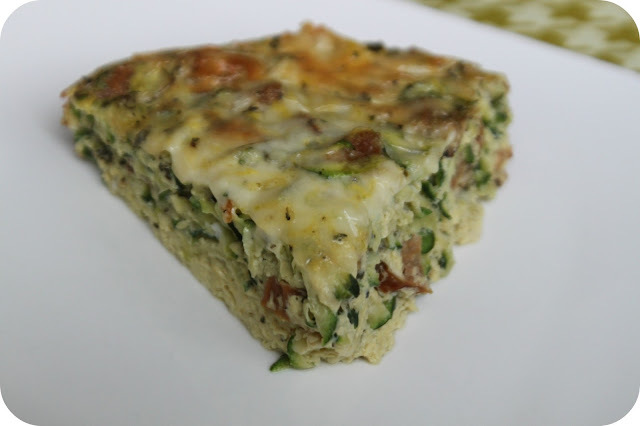 Free-run, antibiotic free eggs, lean Italian turkey sausage, zucchini - low carb, quick and wheat-free. 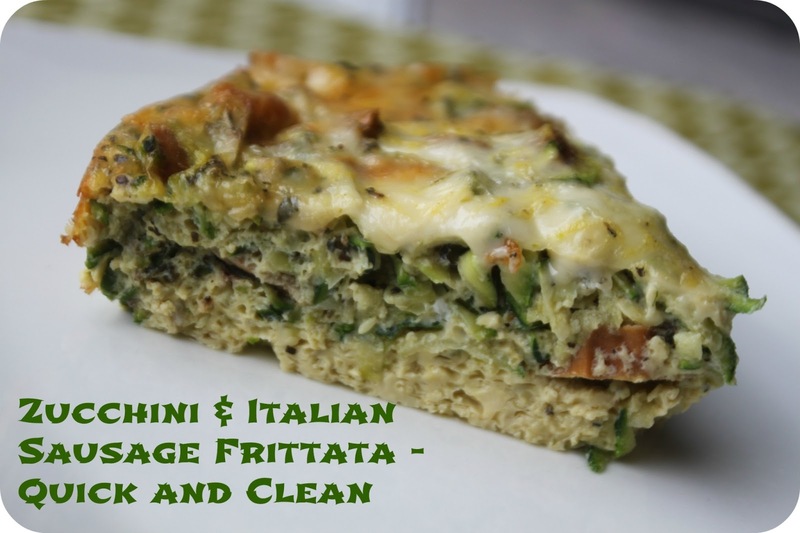 A great week day meal when you are short on time. I can't believe it took me 36 years to discover Fritatta's. They are so simple to make, use basic ingredients and can easily be made clean. They don't have wheat in them (yay) and if you struggle with wanting toast when you have fried eggs this feels more like a casserole so you won't be tempted to take out the toaster. And how can you not love a dish that is full of protein, low in carbs and can basically be made with any kind of meat, veggie and cheese combination. And it works for breakfast, lunch or supper. And most kids will eat it if you include ingredients they like. And.....okay that's enough of a sales pitch. 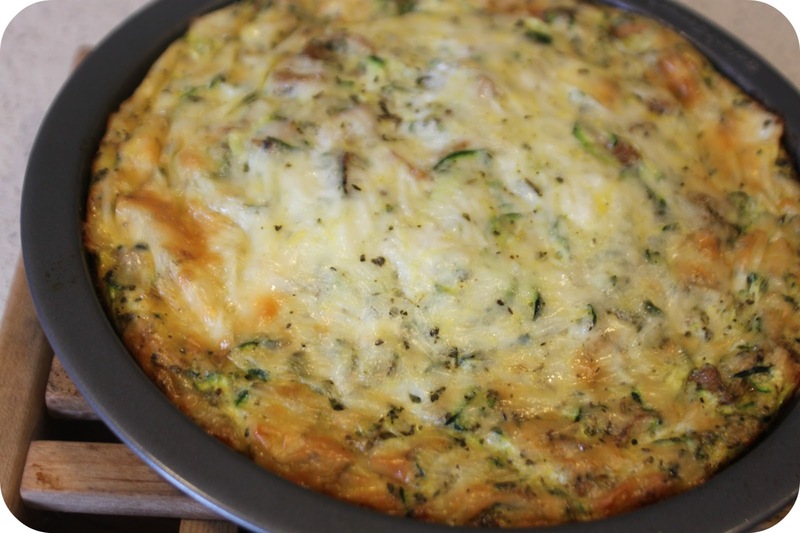 Did you know zucchini only has about 20 calories per cup. That's crazy. What a way to fill up on nutrient dense food that won't spike your blood sugar or hurt your daily calorie count. I buy baby zucchini. They are also good just as a veggie for dipping or in a raw zucchini salad. And next time you grill or bbq why not grill some extra sausage and throw it in the freezer so you have it on hand for a frittata during the middle of the week when you are going to get home from work and need dinner on the table pronto. That's what I did so when I was running low on time and ideas - I quickly whipped this up and it was GOOD. If this is going to be a weekday meal you could also get your zucchini, onions and cheese prepped the night before so you could literally have this in the oven within 5 minutes of getting home from work. This recipe would also be great with some sun-dried tomatoes and/or Parmesan cheese if you really want to get crazy! Awesome served with a salad or fresh veggies. I make it in a pie plate which works fine - just make sure you grease the pan well so the time you save cooking isn't spent scrubbing. Preheat oven to 350 degrees. In a large bowl, mix all ingredients together except the cheese. Pour mixture into a well greased (with coconut, olive oil or butter) 8 inch pie plate. Top with cheese. Bake for 35 to 40 minutes. The egg in the middle should be set. Let stand for 5 minutes before slicing and serving. Yum. Hot out of the oven - doesn't that look good! Yum.